Closing out our trip to Lincoln for the matchup between the Huskers and Buckeyes. And now, it gets ugly. Again, as is becoming typical for these posts, I’m certain the answer is no. At least this time we had an entertaining first half. 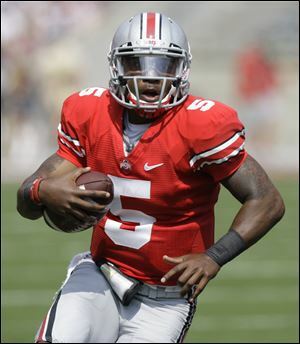 Braxton Miller ran to the tune of 91 yards on the Blackshirts. An offense. For the first half, and the first OSU drive of the second half, we saw an offense that was more than up to the task of moving the Buckeyes down the field. They scored 27 points and gained more than 300 yards, including 250 on the ground. And then Braxton got hurt, and Bauserman came into the game, and that was that. Me not jinxing the OSU offense by asking for silly passing numbers. Success! I think. We got a touchdown to Jake Stoneburner, and had a competent passing game – again, until Bauserman came in. A pick six. Orhian Johnson got a pick, but he wasn’t able to turn it into six. Surprisingly, Martinez passed the ball much more effectively against our secondary than he was able to do against Wisconsin. Credit Nebraska for sticking with the running game to make the passing game effective. Taylor Martinez – Wisconsin Version. Yea, we definitely didn’t get the Wisconsin version of Taylor. We got a much nastier, much more effective variety. The return of the aggressive, angry offensive line. They certainly looked that way in the first half. The run blocking was fantastic, and the pass protection was run to perfection. Not surprisingly, the line was unable to effectively block for Bauserman, probably given how long Bauserman likes to hold on to the football. Carlos Hyde blows past Nebraska's defense on the way to a 63 yard touchdown. The Buckeyes made their first ever trip to Memorial Stadium to play the Cornhuskers for the first time since 1956. Ohio State came out of the gate hot, but snatched defeat from the jaws of victory by allowing the Cornhuskers to score 28 unanswered points over the last quarter and a half on the way to a 34-27 victory. The momentum change in the game came when freshman quarterback Braxton Miller fumbled the ball on the OSU 23 yardline to give Nebraska a spark in the game. Braxton Miller looked much improved during the game, throwing 5/8 for 95 yards and a touchdown, and running for another 91 yards on 10 attempts. The Buckeye offense under Miller looked much improved in this game. While the Buckeyes focused primarily on the running game, they used smart passing plays, including delayed outlet passes to the flat, and even a screen play, to counter the Nebraska defense. In fact, OSU ran a beautiful screen pass to Jake Stoneburner for their only passing touchdown of the game – a 32 yard scamper that saw Stoneburner get touched only when he reached the endzone. OSU also used a combination of other nice run counters to force the defense to the wrong places and open up huge holes. Unfortunately, after taking a 27-6 lead in the game, OSU began to face a stiffer Nebraska defense. Either the offense failed to make appropriate adjustments at halftime, or the Cornhusker defense simply made better ones. In fact, it’s possible that OSU went to a more conservative approach that allowed Nebraska to more easily anticipate the OSU offense. Either way, the Bucks began to struggle to move the football. On a scamper play that would have resulted in a first down Braxton Miller, who continues to not protect the football on running plays, fumbled the ball on his own 23. Nebraska went on to score a quick touchdown and the comeback was on.